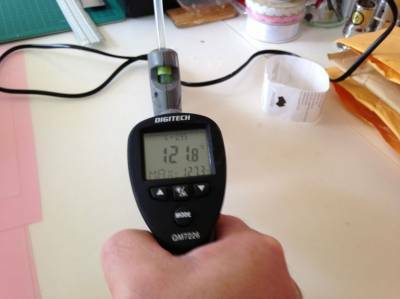 My initial tests measured a temperature of 120 degrees. A good result. Hot enough to melt ABS!. WAF withstanding I went out and purchased a new hot glue gun. It was only $10 from our local $2 store (go figure). You should be able to pick one up from any cheap-as-chips type of variety store. The ones you find in craft shops may be a bit more expensive, but then I assume that they are probably better quality than the $10 ones too. When I got home I could not resist taking the gun apart (don't try this at home kids). My initial plan was to see if I could change the 'nozzle' to something a little smaller so that I could use a single filament but what I found with this particular gun was that the entire 'hot end' was one solid cast part. Interestingly the glue gun is very similar in operation to a standard 3D printer hot end except that the heating element is 240volts. As it looked like it was not going to be possible to easily modify the gun to accept a single filament I decided to move on to plan B. Plan B involved making a large filament. I considered printing some 'filament sticks' on the 3D printer - basically a glue stick made from filament but then decided to simply get a whole bunch of filament strands and bunch them together instead. I opted to use PLA for my testing as it melts at a lower temperature then ABS. 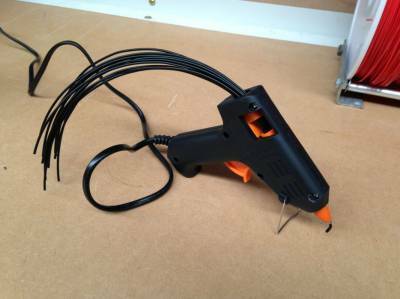 I fed the 'filament stick' into the hot glue gun and waited for it to heat up. Once up to temperature I noted that the trigger mechanism was not really working with the filament bunched up as I had it. It would of course be possible to print out a more suitable design but for the purposes of my test I decided that I would simply push the filament through by hand. I'm obviously not going to win any prizes for my artistic ability but the proof that it worked was reward enough. With the glue gun unmodified the resulting extrusion is quite large in diameter however i found that this is a perfect size for 'gluing' separate parts together, making repairs to prints or otherwise just creating large blobs of molten plastic. I think that it would also be very good for repairing broken plastic items, especially if made from the same material. Whilst I did not try ABS I'm pretty confident that with the end of the nozzle at 120 degrees it will also melt with no issues. A further refinement would be to fit a smaller nozzle to the glue gun to make a smaller extrusion. With a little adaptation it might even be possible to use a standard hot end nozzle. 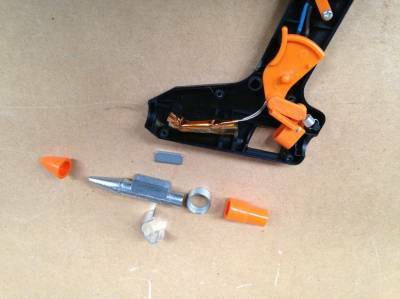 Of course the glue gun is not as easy to handle as the 3doodler, especially with the trigger not functioning so to overcome this issue I designed some filament sticks with grooves around them to engage in the trigger mechanism. This works really well and make the 'filament gun' much easier to handle. 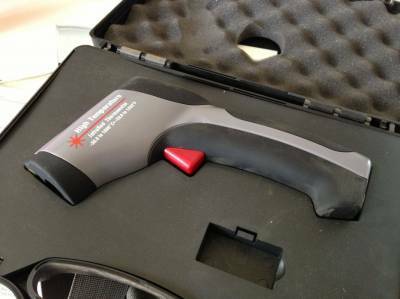 Please be sure to leave a comment and let us know what you used your Filament Gun for.